all the hardship and frustration to achieve mental redemption. That’s exactly the kind of feeling you get while listening to King Giant’s profound, solemn and heartfelt metal anthems. Although King Giant have gotten bluesier and more texturally varied over the course of their three full-lengths, the gritty unrelenting sludge of their debut EP Identity is still discernible at times. For instance, “Shindig” from Southern Darkness and from its successor, the doom-drenched “The Fog”. Black Ocean Waves is no exception when it comes to no frills heavy riffage, in fact immediately after the epic instrumental opener “Mal De Mer” it leaps right into the dominant galloping crunch of “The One That God Forgot to Save”, a harrowing tale of a prostitute’s revenge on the society. 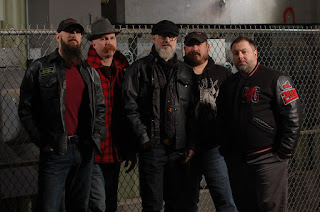 “Trail of Thorns” is again a straightforward heavy rocker about a devil-may-care spree killer full of foot-stomping hooks complemented by a nostalgic southern-fried bluesy solo. And as much as I love Evil Elvis dare I say that nowadays I’m a bit more partial towards David Hammerly? As I find his gravelly baritone more broad and flexible. Black Ocean Waves is also the album where King Giant embrace their melodic prowess to the fullest. As evident in “Red Skies” which more or less serves as the disguised titular track as it accentuates the album cover art in the audible form. An intense composition about the slaughter of an entire whaling ship’s crew by its captain and his regretful confessions. It features expansive layers of harmonized twin-guitar, multi-tracked vocal harmonies and aplenty variations. “Blood of the Lamb” revolves around the perennial debate on redemption. It's a gloomy hard rocker full of sardonic atmosphere and abrupt yet catchy tempo shifts. still, the album peaks with the aptly placed closure “There Were Bells”, a wistful and moving metallic ballad where the band laments the passing of their friends and dear ones most notably the band’s original vocalist Bob Dotolo. 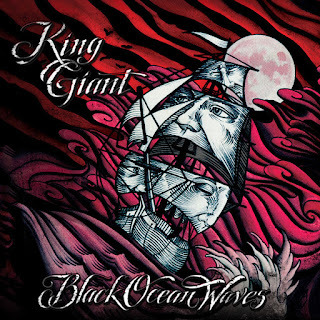 If Southern Darkness and Dismal Hollow were the footsteps that trembled the face of the underground then Black Ocean Waves is that gigantic stomp that would establish King Giant as the bona fide kings of whiskey-soaked nostalgic heavy metal.